Everything influences everything. 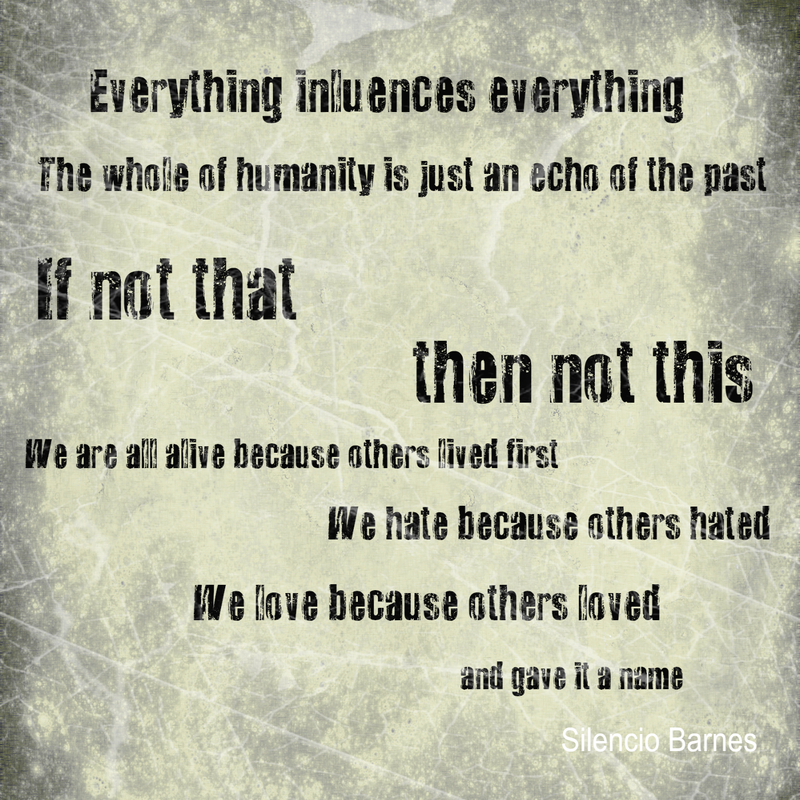 The whole of humanity is just an echo of the past. If not that, then not this. We are all alive because others lived first. We hate because others hated. We love because others loved and gave it a name. We speak because others spoke. We are, because others were. Your genes look good on you despite the fact that thousands and thousands of people wore them before you. There is nothing new under the sun. We build on what came before. We assume we came up with something new, never knowing the seed of that idea was planted way before you picked the fruit. Who are you? Are you your father? Your mother? Your grandparents? Are you a complex system made up of a complex system made up of a complex system of everything and nothing? Divinity lies in our cells as it lies to our thoughts. We are forever, but not in the way most think. Everything influences everything. Today, when you say what you say, it will affect what your children’s children’s children will think. Think about that. Think about it as you realize that your very thoughts were crafted before they entered your mind. Just as it all echoes forward, it all echoes back. We are a moment in time and our lives are made up of a trillion, trillion infinitesimal moments such as this one here…and this one here…and this one here. Who are you? What are you? Why do you breathe? Why do you die? Why do you live? I suppose that in the end, it is what it is. For if it was not, then how could it ever be?